Before you take your new drone out for its maiden flight, it’s a good idea to use a simulator to get a feel for its handling to avoid embarrassing and potentially expensive crashes. You could pay hundreds of pounds for a realistic drone sim, but the strong community spirit of drone pilots means there’s also a growing collection of superb free simulators to help you master your props. There are two main types of drone simulator: those designed to help you practise first-person view (FPV) racing, and those for refining handling of camera drones to help you achieve better video and photos. The best sims offer a variety of courses, variable weather conditions, and realistic physics so you’re fully prepared and know how your drone will respond in different situations. Real licensed drone models are also a boon, as is scope for future development. All of the free drone simulators here let you use your own RC transmitter, which you’ll need to connect using a device like the PCTx (a quick Google search should reveal whether there are any alternative ways to link your specific controller to your PC). Most simulators support game controllers as well, and some even let you fly with a keyboard and mouse, though you’d need three hands to control a quadcopter with any success. The official simulator of the professional Drone Racing League, DRL Drone Racing Simulator is the most polished of the free drone simulators here. It’s currently in beta, but the League was confident enough to use it for pre-qualifying for the 2017 world championships. DRL Drone Racing Simulator features courses from the real competition, and is scored in the same way, with points earned from a combination of checkpoints and completion times. Real-life DRL racing drones are fully customizable, and so are their simulated counterparts. Outdoor maps are fairly realistic, but the simulator really comes into its own indoors, where LED-clad drones hurtle through a Bladerunner-style tangle of neon. DRL Drone Racing Simulator is compatible with both console and RC controllers. There’s a menu option for keyboard controls, but in our tests the sim failed to detect any hardware; something of a moot point, because the fine-control necessary for navigating the complex courses at high speed would be almost impossible with key-hammering. Hotprops is also in active beta, available to download and enjoy with no restrictions. 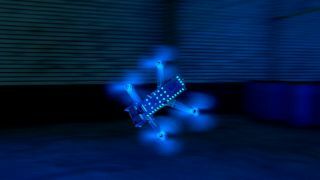 Like DRL Drone Racing Simulator, the goal of this great-looking sim is to reproduce the experience of FPV drone-racing as accurately as possible, with advanced physics courtesy of the Unity game engine. Hotprops offers fully adjustable parameters to replicate the behavior of your own drone as closely as possible. The settings offer a very impressive degree of granularity, and the impact of each slider and radio button is clearly explained. Hotprops’ developers are constantly adding, removing and adjusting features in response to testing and user feedback. As a result, there can be considerable wait-times while the sim is updated automatically at launch – sometimes up to half an hour. There’s more loading mid-sim too; even if you don’t intend to pit your skills against friends or strangers in the game’s multiplayer mode, you’ll need an internet connection to download courses before you can fly them. The simulation itself is superb, with realistic flight physics and smooth, good-looking graphics. There’s a great choice of maps to test your skills, and they’re fun and varied enough to enjoy as a racing game in their own right (albeit one that requires an RC controller). We don’t yet know whether the Hotprops release candidate will be free-to-play or carry a subscription fee, but the active beta is very promising. One to keep an eye on. Real Drone Simulator is in pre-alpha (an early testable release), so it’s still a little rough around the edges and doesn’t yet have a full complement of courses and features. It’s very promising though, and the developers are planning to keep it free to play, with optional donations to support the project. Real Drone Simulator offers two types of environment to practise your skills: ‘virtual reality’ (realistic but computer-generated) and real-world (based on Google Earth). Each level has a difficulty profile, area size and wind strength, so you know what to expect before starting your props. The physics and handling are realistic, and adjust to the weather conditions, but Real Drone Simulator is designed for fun, first and foremost. The final release will gamify the experience with a career mode that lets you earn virtual currency to upgrade your drone, and race it against other pilots locally or online. You can control your quadcopter with a transmitter connected via USB, with a gamepad, or with a keyboard and mouse if you’re just playing for fun and have an extra arm. Real Drone Simulator’s developer (the Real-Team) has some other ambitious plans up its sleeve, including the addition of photography and aerial filming missions, and international championships in the style of DRL: the sim already contains some licensed racing drones, and the Real-Team intend to contact all the major drone manufacturers when they hit beta to request permission to license their craft. As its name suggests, Heli-X Flight Simulator is primarily an RC helicopter sim, but the free version also includes one quadcopter – the DJI Phantom. This prosumer drone is designed for aerial photography and filmmaking, and Heli-X is designed to help you refine your handling before you send £500 of hardware skyward. Heli-X offers a great selection of training modes to test your dexterity, though there’s little mileage if you’re looking for a simulator that doubles as a game; the tasks are challenging, but there are no rewards beyond the satisfaction of beating your own high-scores. The free version only offers two airports and one training course, though this can be populated with various obstacles. The handling settings are highly customizable, but the defaults have been set by a professional pilot to provide a realistic experience, so there’s little to be gained from tweaking them in you’re training to operate a real Phantom. If you have trouble running Heli-X, make sure you have the latest version of Java installed, then try the Java-based version instead. Practising with a free drone simulator is a great way to get used to the way your drone handles, but it's never going to be exactly the same as the real thing. Before your real maiden flight, check our guide to essential drone safety and maintenance to avoid any accidents or near-misses.